COSMOS is the ultimate tool for sonic enhancement and low-end fattening that will elevate the sound of your tracks to soaring new heights. This audio sweetening plug-in faithfully emulates legendary audio hardware that is used in professional studios worldwide. COSMOS can be used in virtually any application. Naturally, COSMOS excels in the recording studio whether you need lead vocals to pop out more in a mix or boost the low end of a bass guitar. 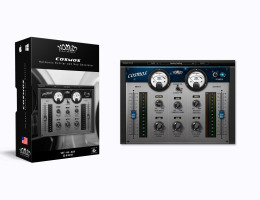 The plug-in is especially useful when placed on the mix bus to enhance an entire mix. Engineers have been using comparable hardware for decades and now COSMOS delivers the same sonic signature that can be found on countless hit records and award-winning productions. COSMOS is designed to improve clarity and punch without increasing gain, which results in a more balanced sound. The plug-in uses harmonic enhancement instead of traditional EQ boosting to bring out desirable frequencies in your audio material. AAX Native, RTAS, AU and VST plug-ins. You can authorize our software on up to 5 computers with a simple one-click authorization procedure (no dongle key required). You can authorize this software on up to 5 computers with a simple one-click authorization procedure (no dongle key required).